When you first think of adding a stair lift to your home, the first thing that you may think of is how costly it may be. With today’s economy, it is no secret that many people cannot afford luxury items. But what about those items that you truly need that aren’t luxuries? If you are unable to scale the stairs in your home, then you have probably been considering adding a stairlift and examining the costs. By adding a stairlift to your home, you will be given the freedom of exploring the upper levels when you may not have been able to before. When shopping with us to find your stairlift, you will be able to find models in all price ranges. Browse our stairlift selection to find the perfect one for you; whether you need to scale the stairs on the exterior or the interior of your home, you will be able to find an affordable lift in our online store. Not only will you have the convenience of a stairlift in your home but you will also have a bit of extra money in your pocket left over after you add it to your home. After you evaluate your finances, consider our stairlift prices and various financing options. You will be able to finance your stairlift at a price as low as $89.00 per month to bring convenience into your home while sticking to your budget. If financing isn’t right for you, then you may also want to consider a used stair lift as an even more inexpensive alternative. We offer a variety of ways to save you money while still adding a stairlift to your home. 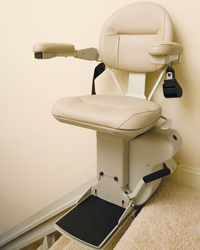 You don’t have to empty your wallet to have all of the convenience that a stairlift can bring to your life. Stairlift prices don’t have to be high for you to get all of the quality and customer service that you deserve, so contact our customer service department today to get started on your stairlift order.